It’s true, Mitch McConnell doesn’t have a 60-vote majority in the Senate. It’s true that this Senate has twice as many people over 80 than it’s ever had, and its members’ age and health have made it more difficult to vote more than a few times. But it’s also true that Mitch McConnell has the power to make “the resistance” do their jobs, instead of spending their days in the field campaigning, safe in the knowledge that Obama’s men are still hard at work in this new government of theirs. Republicans believe their threat to change the rules is something that has Democrats thinking twice about dragging out the debate any longer. Democrats can't block any of Trump's nominees, as long as Republicans are united, thanks to a rule change Democrats imposed in 2013 that allows confirmations with just 51 votes, instead of 60. African-Americans deserve to know that Jeff Sessions is their friend and the friend of all law-abiding Americans. The Democrats who are preparing these false charges think they have to do it to keep Americans divided, blacks against whites. Fortunately, the prevailing winds are against them. It all started with Jeff Sessions. Let it end with Jeff Sessions. Now. Once and for all. 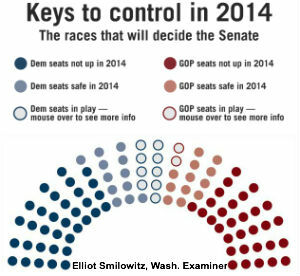 Senate R's are reaching out to about 9 Dems they see as crucial swing votes in the new Congress. With his 54-seat majority, Senate Maj. Leader Mitch McConnell is 6 votes short of overcoming Dem. filibusters, making bipartisan support a necessity for getting most legislation to Obama’s desk. A new political advocacy group has teamed up with former Sen. Jon Kyl (R-Ariz.) to argue that the economic inequality agenda of Senate Democrats is a loser with swing voters. Recent polling shows that an election wave of anti-ObamaCare sentiment is growing, and it's not only likely to hand the GOP control of the Senate, but might wipe out as many as 12 Dem. seats--many of which looked safe 2 months ago. Senate Dems on Tues. voted (54-46) to refuse to enter into official negotiations with the House on a spending bill, saying there can be no talks until the GOP agrees to end the shutdown. The issue's back with House R's, who've seen the Senate kill 4 proposals to end the shutdown.